I have a student who started using coloured pencils and botanical art, last summer. As far as I am aware she hasn’t done anything like this before. Su became enthralled with botanical art and will do it at any time she has a spare minute – even if it’s only five minutes before going to work. Su’s botanical art work has improved so much over such a short time. What do you think? By the way, it is incomplete, but already very impressive. 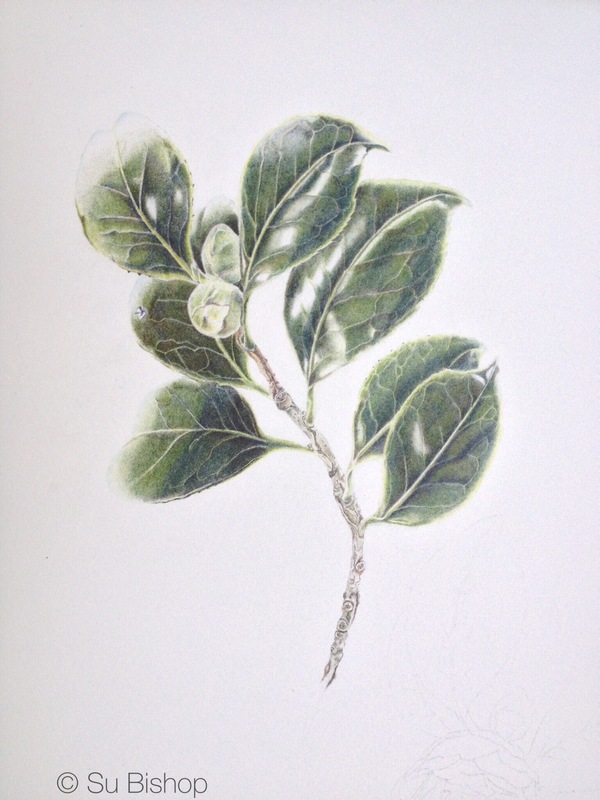 < Botanical art workshop report from Twigs and things. Than you Jennifer, I will tell her. Thank you, I will tell her. Thank you on behalf of Su. I think it’s fascinating when someone finds something that they are clearly going to be really good at. Who knows what any of us may find tomorrow that we had never even thought of. Congratulations to Sue for her beautiful work and to you for teaching her. I agree 100%. It just shows that we all have gifts we had never even considered. I will forward this to Su as I am sure she will be glad of your comment on her work. Thank you. Yes, there are a lot more than one would initially imagine in ‘green’ leaves.